These great roll up recipes are perfect appetizers for any party and they are simple to make ahead of time. The day before your party, you can put together a platter, cover with plastic wrap and they'll be ready to pull out and enjoy. The roll up recipes here are for two different versions, and I usually make both and put half and half on a platter, but when storing in the refrigerator, wrap them separately since they will absorb flavors from each other. Soften the cream cheese in the microwave--about 15 seconds in a glass dish. The only reason to do this is so it is easier to spread on the ham--you could also try using spreadable cream cheese. When the cream cheese is soft enough to spread, place a thin layer over an entire slice of ham like you're buttering a piece of bread. 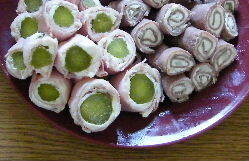 Place a pickle on the end, or two pickles end to end if your pickles are short, and roll them up. Continue to do this until your out of ingredients or you've made enough. Chill them in the refrigerator for an hour. This makes them easier to cut. When you take them out of the refrigerator, cut them in bite size chunks. They will stay rolled up because of the cream cheese but you can also insert a toothpick for easier eating if you'd like. I just pile them high on a plate and serve them up. Soften the cream cheese in the microwave--about 15 seconds in a glass dish. The only reason to do this is so it is easier to spread--again, you could also try using spreadable cream cheese. When the cream cheese is soft enough to spread, place a thin layer over an entire slice of roast beef like you're buttering a piece of bread. Sprinkle green onions on top of the entire slice of roast beef, and roll it. Continue to do this until your out of ingredients or you've made enough. Chill them in the refrigerator for an hour, making them easier to cut. When you take them out of the refrigerator, cut them in bite size chunks. Similarly, the roast beef will stay rolled up because of the cream cheese but you can also insert a toothpick for easier eating if you'd like.